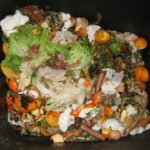 How much waste do you generate in one month? Pål Mårtensson is a Zero Waster from Sweden, where he runs the famous Kretsloppsarken reuse and recycle park, who decided to check by himself how much waste does his household of four generate. During one month Pål separated, measured and weighed the different waste fractions and the result has been amazing in many ways: “It was very easy, didn´t smell (careful cleaning) and you got a very good view of your waste when you look att it almost every day and that you take care, handle it not as waste but as resources. Out of almost 60 kg “waste”, there were only 0,9 kg I couldn´t handle in a satisfied way (probably goes to burning or bury). I´m very happy that so little is left for the burners, there will be a lack of waste for them if everyone made my example as a habit.” says Pål. Want to check the detail? Therefore for a household of 4 pers and a period of one month including Christmas and New Year Pål’s family has generated 60kg. 15kg per person in average where the part that could not be composted, reused or recycled was only of 1,6%!! Of course, the experience mentioned above is not representative (besides being only one example, Pål’s family generates 180kg per person/per year when the Swedish average is 480kg) but it does show the possibilities to live in a more sustainable way and how if all Swedes would follow Pål’s example could afford to close down all incinerators and radically increase recycling and composting. There are Zero Waste experiences around Europe that confirm that what Pål has done can be repeated and it shows that, after all, it is up to us to make Zero Waste possible!